The club welcomes everyone to row, regardless of age (or size!). Scarily you actually become a masters rower at the age of 27, although most rowers under 40 still row in the main senior events. All the local regattas have masters events and different age groups can row against each other with a handicap system. There is a very strong masters rowing scene at DARC. 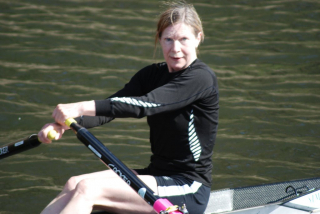 Many members were successful oarsmen and women when they were younger, some have taken a break in their rowing careers but as their children have grown up and the waistline has started to expand the call back to rowing has got stronger. So if you used to row and want to take it up again you will be very welcome. We also welcome new oarsmen and women who have never tried the sport before. Some just row for pleasure and to keep fit. Others decide to compete in regattas and there are a number of events specifically for them as a class called masters novices. These are for people who come to the sport late in life and have never won a regatta event in their life. Below are just a couple of profiles of sections of the Masters squad, although this is by no means everyone! In addition to those below we have many crews spanning different ages and many competing in smaller boats. 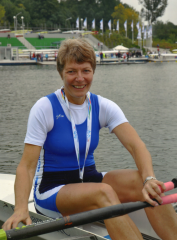 Most notably we are proud to have Gill Prescott (right) rowing at DARC – five times gold medallist at the World Masters Regatta in Varese in 2013 and again in Hazewinkel in 2015, and current world record holder in the women’s over 55 age group for 2 km indoor rowing! 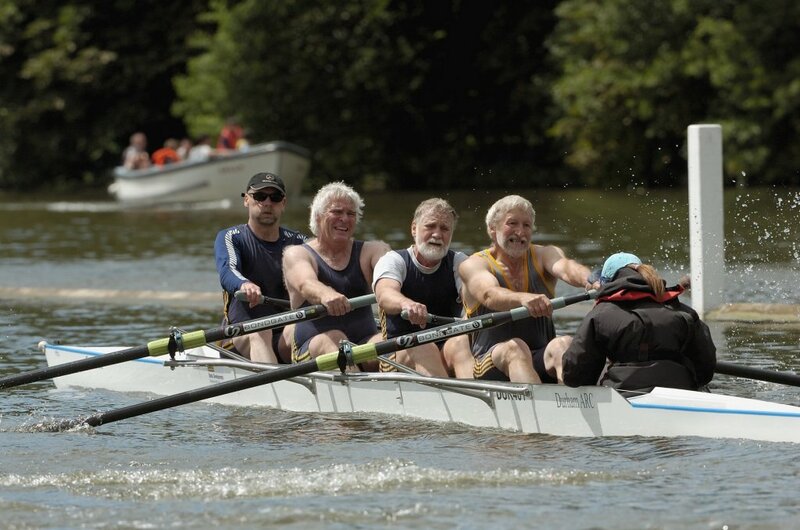 We have a large number of masters mens crews, covering the full ranges of ages and abilities. So wherever you fit, you’ll be more than welcome. The main criteria is simply showing up in the bar! We have a Masters A (average age 27-35) squad, who are mostly novice oarsmen, many of whom have come through the club’s successful Learn to Row / Explore Rowing courses. Right through to the Masters E/F squad (average age 55-65), who can tell you many a story about past glories, and train very hard to try to re-live them. They have had some great successes at the British Masters, Henley Masters and the World Masters Regattas over the years. They came back with medals from the World Masters in Varese in September 2013, and from Hazewinkel in 2015, to add to the Gold and Silver from the British Masters earlier in the year. The women’s IM3 squad formed in September 2012, and is a mixture of rowers with points and experienced novices. 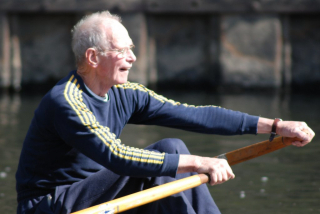 Ages range from 33 to over 60, so all are eligible to row as masters. Numbers have grown from an initial group of 10 to around 40, most of whom can scull as well as row. The squad is divided into development and performance groups. Crews have competed in coxed quads, winning at York and Durham Heads and Nottingham Masters of Trentside Head. An IM3 8 rowed at Rutherford Head, beating 7 other IM3 crews. 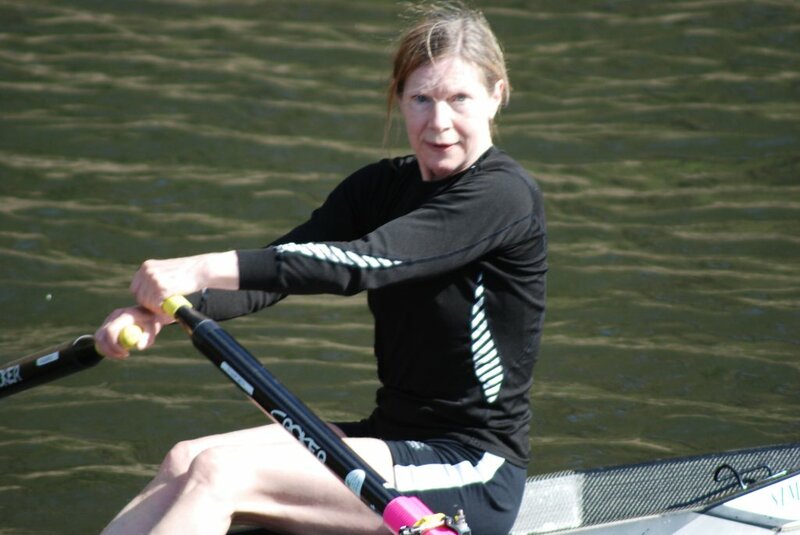 Crews have also rowed as Masters C and D at Tyne Head and at the Women’s Eights Head of the River Race on the Thames, where they finished 222nd in 2013 and 153rd in 2015, out of over 300 entries. Regattas at Strathclyde Park, York and Durham City are included in the build up towards the British Rowing Masters Championships at Nottingham in May/June. Competing at Durham Regatta and Henley Masters completes the season. Hopefully the brief outlines of just some of the sections of the Masters squad have given you a flavour of masters rowing at DARC. So whether you’re an ex Olympic oarsmen or someone who has never rowed before, come and join us. Winning, even at local regatta level, requires many hours of training. Most would agree that the general high level of fitness which results from the training gives a sense of physical and mental well being which is hard to beat. Come and join us and recreate the days of your youth. Well almost!! Many masters are down on a Sunday morning around 10am.